Hartlepool United manager Matthew Bates. Matthew Bates is determined give the Hartlepool fans something to cheer about in their final home game of the season. Pools welcome strugglers Torquay United to Victoria Park this afternoon, and Bates is keen to see his side reward supporters after a difficult season. With United having struggled both on and off the park this campaign, the caretaker boss wants to end on a high note with victory over the Gulls. But with Torquay in need of a win to have any chance of securing National League safety, Bates knows that Hartlepool will be in for a difficult afternoon. Torquay’s situation is one Bates knows well, and the former Middlesborough man believes similarities can be drawn between the Plainmoor outfit and Pools of a month ago. “It’s hugely difficult. We’ve been there, we know what it’s like,” he admitted. “In March we went on that great run and that’s the kind of run that Torquay need. “We know the mental attitude that they’ll be coming in with and they’ll be giving it everything. While the players can relax on the field, so can the fans off it with survival now assured. Another vocal crowd backed Bates’ team on Tuesday evening and, while they haven’t had a great deal to cheer about this season, they have continued to back United. And now Bates has stressed to his players the importance of rewarding the Pools’ faithful in the last Vic outing of the campaign. “They’ve not had much to cheer over the last couple of seasons, but they still come out in thousands and are cheering for us. 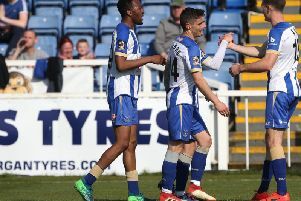 “I’ve always said that Hartlepool fans will forgive anything except hard work, desire and playing with your heart on your sleeve and for that badge. As long as your players do that I think Hartlepool fans will forgive anything else. “That’s always been my message to the players and my aims going in to the home games.